Custom notepads are a useful item your clients will love to receive - use them as a fantastic giveaway product that displays your branding on every page. They’re also a professional option for personal use - bring them to meetings and see your name and logo printed on every note you take. Our custom notepads are produced in rich, bold colour, on our luxurious uncoated paper in white or Brown Kraft. We offer sizing options from small pocket Mini Notepads with rounded corners to large letter size. Can Notepads have foil or other specialty features added? You can have a foiled design (like the metallic logo seen in the image above) added to your notepad order by submitting a Print Quote request for pricing. 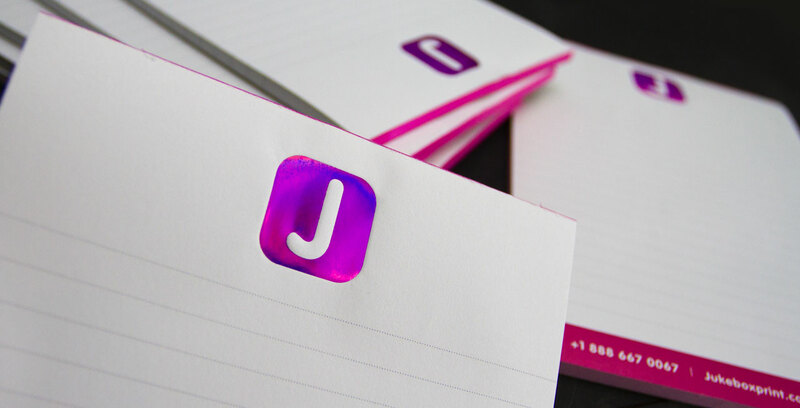 Other specialty add-ons that are available with notepads are embossing, rounded corners, and even coloured edges on certain paper types (the thicker the stock the more effective this will be). Please request a Print Quote for pricing and ordering of notepads with specialty add-ons. Do you have pre-made notepad designs? Can you print offset notepads or large quantities? form to receive a quote from our Print Estimations team. Yes, we certainly do! As this is considered a custom job, please submit a Custom Quotation form to receive a quote from our Print Estimations team. We can also bind on the long side, coil-bound or even with a cover (additional costs may apply) – submit a Print Quote request for these options. Our Notepads are bound along the short side with padding glue. They are mounted on a thick 18pt 100% recycled brown kraft stock backing. request for pricing and ordering of this product. For custom shapes or very small sizes, die creation fees may apply. Yes, we accept full bleed designs. Can you print a full background colour? We can print a full background colour if desired; however, this may print inconsistently on the uncoated stock, especially if dark colors are used. Will my design show through on the other side? Since a thinner stock is used for notepads, show through will be slightly visible on the other side depending if you are holding the single page up to a light source, the darkness of the colors used in your design, and the colour of the paper you have chosen. Can I print on both sides of each page? Yes; but double sided notepads are only available via a custom order. To request pricing and order this product, please submit a Custom Quotation form. Can the corner radius or number of rounded corners be changed? 0.5” is available upon request and 1, 2, 3 or all 4 corners are also available upon special request. Can I have notepads created in a custom die cut shape? We can create a custom shape for your notepads; however, please note that a one-time die creation fee will be incurred and there will be limitations to the shapes available (one edge must remain flat for gluing). Please submit your dieline via a Custom Quotation form for shape approval and pricing. Can the peel off page stay sticky like a post-it note? No, we do not offer this type of product. Can my design bleed to the edge? Do the notepads come with covers? Our standard notepad products do not come with a cover – but we can do custom covers, please submit a Custom Print Quote for pricing.